Once you’ve fuelled up, scored a worldie and pulled the sickest of backflips, here’s where to search between a Gas Station, Soccer Pitch and Stunt Mountain. Triangulating these locations doesn’t quite give you an exact spot to search, so we’ve done the legwork and pinpointed exactly where you need to go. You’re heading over to the northwest of the map for this challenge just south of the soccer pitch in Pleasant Park. The location of this week’s hidden Battle Star is between the Gas Station to the west of Loot Lake, the Soccer Pitch in the south of Pleasant Park and the Stunt Mountain to the southwest of Pleasant. Just to the northeast of the Stunt Mountain and west of the Gas Station there’s an area where the grass is patchy and there’s a rocky outcrop in the top left corner. Slightly to the east of here is where the Battle Star is. It’s next to a silver birch tree. When you’re done with this challenge, how about a spot of driving? Take a look at our Flaming Hoops locations guide for help with that challenge. For a hand with the rest of this week’s challenges, check out our Season 5 Week 4 challenge page. 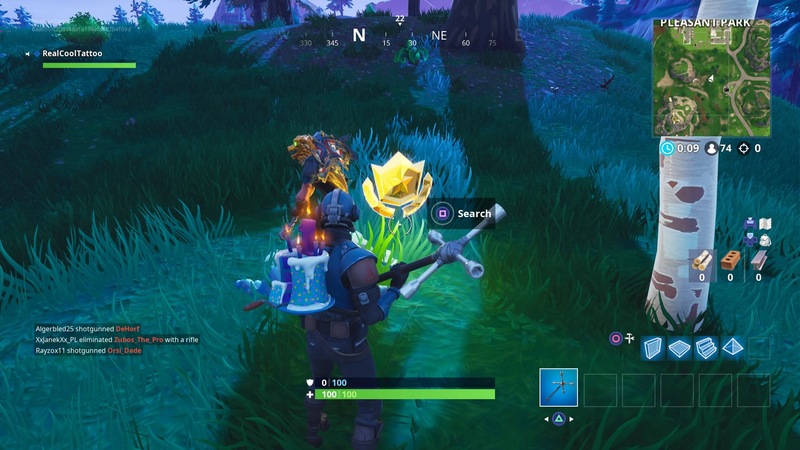 The post Fortnite: Search between a Gas Station, Soccer Pitch, and Stunt Mountain location appeared first on VG247.